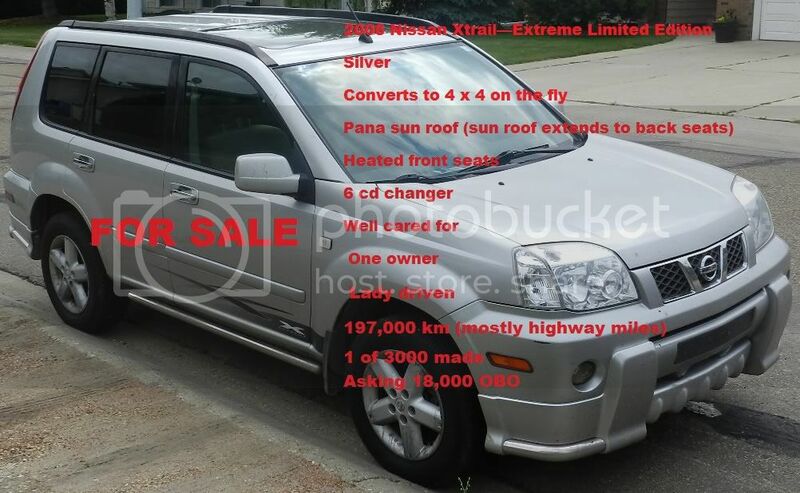 Status Used Year 2006 Make Nissan Model X-Trail Kilometres 198,000 km Style/Trim Extreme Limited Edition Drive 4X4 Exterior Colour Silver Located in Fort Saskatchewan Ab. Description Nissan manufactured this edition in very limited numbers. Nissan Xtrail-extreme has additional moulding on the body. [u]Located in Fort Saskatchewan [/u] Asking 18,000 OBO Serious Inquiries only . http://s1074.photobucket.com/albums/w405/Conroy_Family/2006%20Nissan%20X%20Trail%20For%20Sale/ <<< MORE PICTURES HERE !!! Pm me and we can talk or you can arrange to talk over the phone , no BS or games , Scammers will be hung in a tall tree on a short rope .